Performance Time: Approximately 120 minutes, 92 pgs. FARCE. 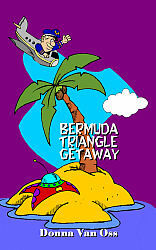 When a plane headed for Hawaii crash-lands on an island in the Bermuda Triangle, it isn’t long before pandemonium breaks out as the wacky passengers and crew make themselves at home. There’s a pilot who thinks he’s Dr. Evil, a co-pilot who acts like Mini-Me, a hypochondriac, two credit card salespeople, a wannabe cannibal, five beauty contestants, and two celebrities disguised as Iowa hicks. And then there’s the island’s inhabitants to contend with—a bunch of aliens disguised as natives! This hilarious farce spoofs “Gilligan’s Island,” “Romeo and Juliet,” and “Austin Powers,” and features scene-stealers for everyone in the cast! Donna Van Oss has taught high school drama for more than 10 years. She has helped her students write and perform various works from full-length plays to short children's theater scripts. She and her husband live in Baton Rouge, LA, with their two children Sam and Amelia.